Gordon arrived at Ventnor from Yatesbury in August 1950 and remembers struggling up The Shute in his greatcoat and with kit bag on shoulder in the blistering sun with Eric Sandaver another new arrival. Gordon was a radar operator of the CHL kit and believes the personnel numbered about 50 at that time. 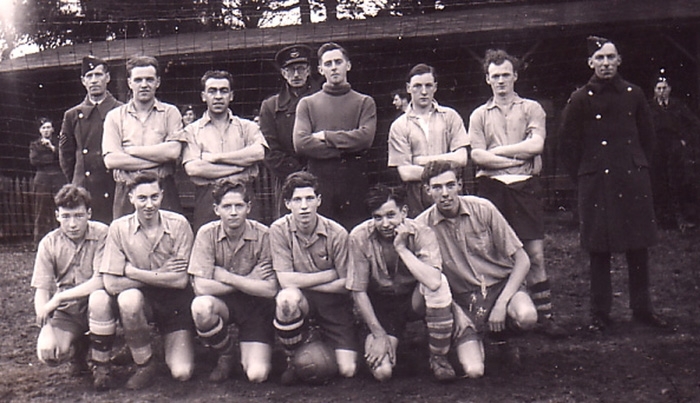 THe Flt Lt CO and the FLt Sgt SWO are in this picture of the station football team. He was billeted in the Down Road site. He recalls one particular bloke, Reynolds Morton, who was a an amateur pyrotechnician who delighted in demonstrating his home made fireworks. A particular trick was to detonate a larger example under an upturned dustbin to blast it onto the hut roof. Gordon played on the wing for the station football team and is the one kneeling down second left, with Eric Sandaver standing immediately behind. A perk from playing football was the Wednesday evening meal of fried egg, mash and peas. Food rationing was still on and this was regarded as luxury compared with the usual 'Chappie' dog food based diet! Gordon remembers the same night exercise as Harold Lewis when armed with rifles they had to defend the top site from attack by the army. The non arrival of the attacking force was greatly appreciated after hours out in the cold windswept gorse. Another abiding memory is the dismal Sunday night journey from Waterloo. First a train packed with matelots had to be endured, then a walk to the 1 am ferry, a long wait and then the very slow milk train from Ryde and a trudge up to the camp at 5am. His association with Ventnor came to an end in February ’51 when a half-dozen operators were posted to Wartling but he was sent on to 'the big stuff' GCI at Sopley - and to a much less desirable isolated domestic site of Ibsley out past Ringwood on the edge of the moors in nissen huts! Later after ‘A’ Watch was moved to the domestic site at St Leonard's Hospital he met and married a lovely Bournemouth girl. After 52 years of marriage they now live between Brisbane and the Gold Coast in Queensland, Australia. Gordon's business life was originally in the printing industry and after emigrating to Australia in ’73, in Production Engineering until retirement in ’97. Gordon will be delighted to hear from anybody whose memory has been stirred by the above.